Paulownia wood for strip planking is a topic important for building strong and light boards. 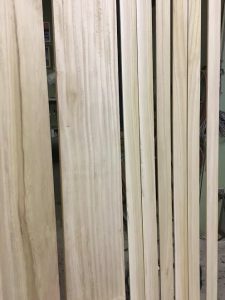 We have discussed paulownia wood for strip planking hollow wood SUP’s and surfboards in the past and now I want to make a few more points about how perfect this wood is for strip planking. I should first make it clear that I sell paulownia lumber on my website, so I obviously have a stake in promoting the use of paulownia wood for strip planking. But the reason I sell paulownia is because I believe that paulownia is by far the best wood available for strip planking hollow wood SUP’s, surfboards and kayaks. Why is paulownia wood such a perfect material for strip planking? The answer to this question is simple; paulownia is amazingly light weight and has an extremely high weight to strength ratio. The wood data base describes paulownia tomentosa as having a dry (12% mc) weight of 18 pounds per cubic foot of material but I find that much of the material I use is consistently in the 14-16 pound per cubic foot range. Practically, what using paulownia wood strips means to those of us building strip planked SUP’s, surfboards and kayaks, is that we can, by using paulownia wood strips, get the weight of our finished boards down to the same weight range as most production boards of similar size and volume. If you have ever built a board that you found to be heavy to carry you will understand immediately that board weight is a big factor for many paddlers. In fact, many potential wood board paddlers specifically site “weight” as one of the major reasons for not wanting to paddle a hollow wood board. Clearwood Paddleboards is now offering a milling service for paulownia lumber as well as selling lumber packs. Now, instead of lumber packs being the only way to buy the material, we are offering wood strip milling at a nominal charge. 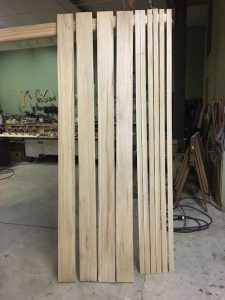 The pre-milled paulownia wood strip option is a cost effective way to get your project started quickly and efficiently. Here’s a link to our materials page on the Clearwood Paddleboards website.